Please note, that this is not investment advice! This is only for education and research. See our Terms. There are many cryptocurrency trading bots for sale. Just do a quick google search and you will find a variety of websites selling you the ultimate bot. However, you should be very cautious of accepting such an offer. Ask yourself, why would anyone sell their working crypto bot instead of just making money with the strategy themselves? If they sell their bot, they will diminish their own trading returns. 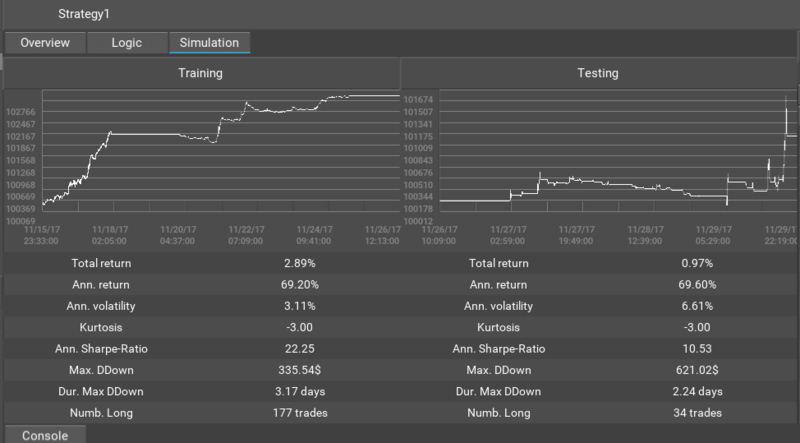 The more traders follow a strategy or bot, the smaller the returns. They might actually make money from the people by following a pump-and-dump strategy. However, as a trader you will lose. So, the only way to have your own bitcoin or altcoin bot is to create one. 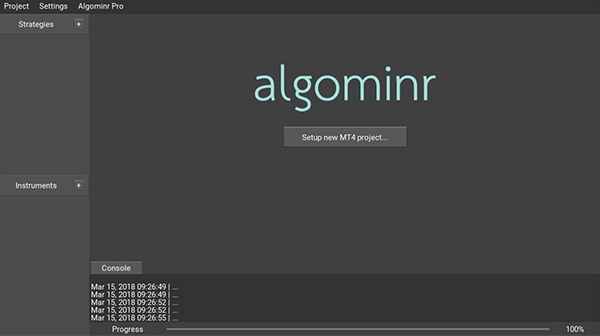 As previously mentioned in another article, Algominr works great to create a crypto bot. In this short article I will revisit the idea and show you some advanced options. You can always create a practice account if you don’t want to immediately risk your own funds. A practice account will give you ‘play money’ that will help you test your crypto trading bot without any risk, it mimics real trading. Download and install Metatrader 4 from one of these brokers. If they are not to your liking, a more complete list of brokers that offer cryptocurrencies can be found here. Start Algominr. You will be presented with an empty workspace. Click on Setup new MT4 project. This will ask you to set the MT4 connection and to save a Algominr database that is used to store historical data. Next you will be asked to import some instruments. Scroll down and find the crypto currencies your bots should trade. I will just go with the pre-selected version. 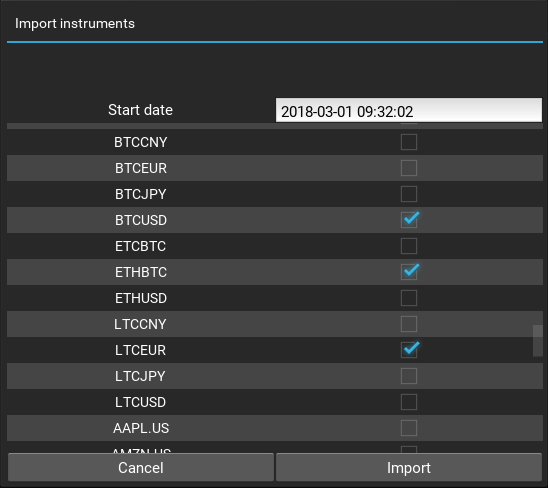 Make sure the Trade instrument is the symbol you want your crypto bot to trade. 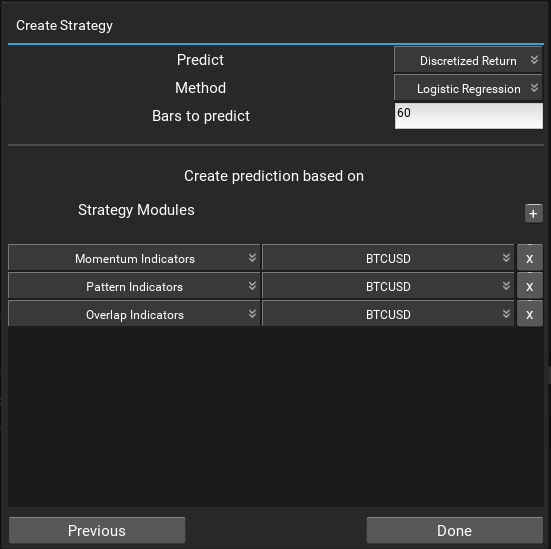 Also set the order size to 0.1 (or even smaller) to trade 0.1 bitcoins per trade. 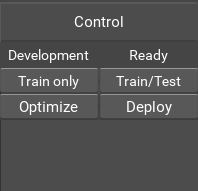 Click next and you will be presented with a screen to chose which types of inputs your strategy should use. It will try to make price predictions based on these inputs. You can chose different indicators. Bars to predict tells the bot how far into the future it should make predictions. It is set to 60 bars, which translates to 60 minutes. Click on done once you are satisfied. On the left hand side you can now see the strategy you’ve just created. Click on it to open the strategy view. Now, initially, you will want to train and test your newly created strategy. On the right hand side you can see the strategy control. 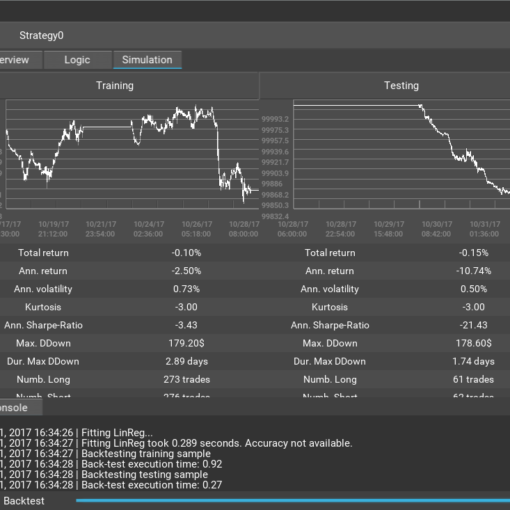 Click on Train/Test to train your crypto bot and simulate its performance on historical data. 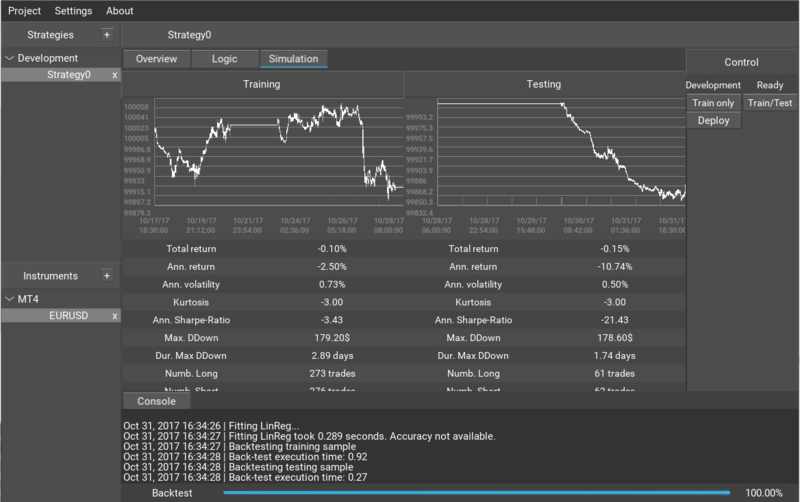 Once the back-test has been performed, you can find the performance of your bot in the simulation tab. 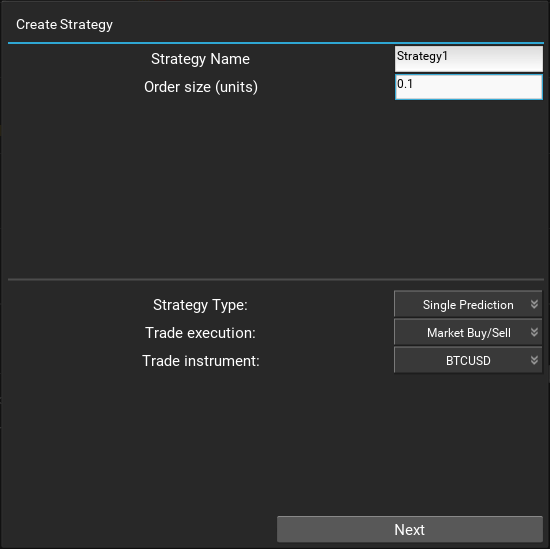 If you are happy with the performance, you can click on Deploy (in the strategy control bar, see above) and the crypto trading bot will start executing trades through MT4. Before you do that, please make sure that you are on a demo account. 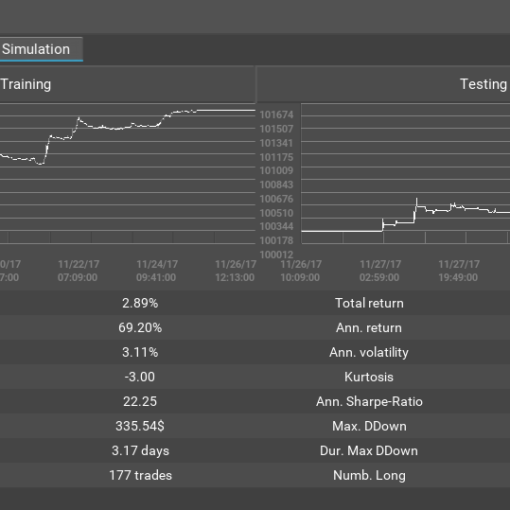 You should trade your strategy on a demo account to make sure that it actually works. Past performance is not necessarily a indicator of future performance.